Tomorrow Mackenzie has her follow-up x-ray of her back to see if the brace has been helping. 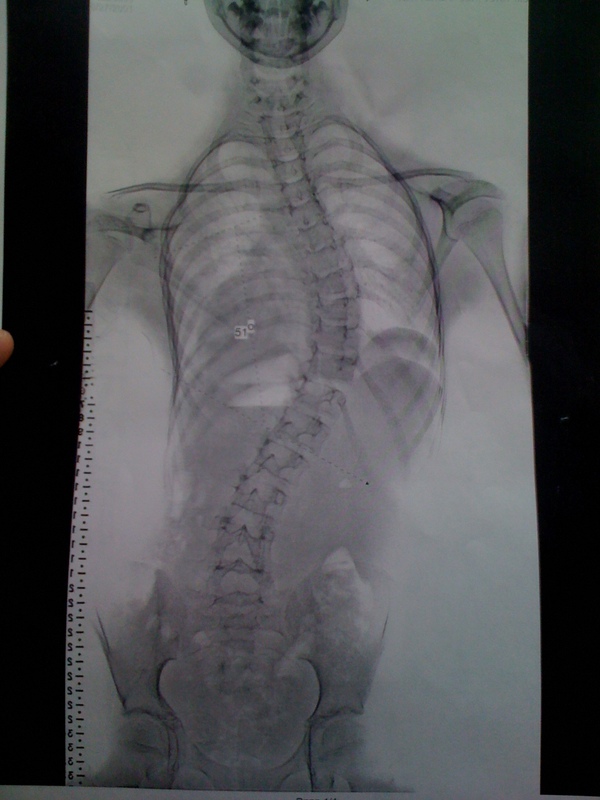 She was diagnosed with scoliosis in June 2011. A few weeks before that she was in a bathing suit for a pool party and I realized how curved her back looked. I felt bad for not noticing it before but I don’t really see her without a shirt and she’s been taking her own shower for a while now. So we made an appointment with a doctor who specializes in pediatric scoliosis and went to see him. Bracing is recommended for curves 25°-45° and surgery is recommended for curves 45°-50° and over. Mackenzie’s curve was 51°. The nurse came in and was already talking about surgery, how long recovery is, how long the surgery would take. The doctor came in and told us that she has a severe case and he usually operates when the curve is closer to 60°. He recommended that we get a brace for her and hopefully that will prevent the curve from getting worse. He didn’t want to do surgery now because doing so would stop the spine from growing. He wants to try to keep her in the brace until she hits the big growth spurt to get her to grow as much as possible (he guessed about 2 years). This way her spine and legs would be more proportional after surgery. He said that he has had good success with the brace, but the patients with success had curves around 20°, not anywhere near Mackenzie’s. So, the main goal for her now is just to keep the curve from getting worse. A few weeks after that appointment we went to get Mackenzie fitted for her brace and then a couple weeks after that we went and picked it up. Mackenzie was so excited about getting it but after that first night (it’s called a Providence brace and she only has to wear it at night) she didn’t like it anymore. It makes her sore and it really does not look comfortable. On her left side it starts right below her arm down to her waist and on her right side it starts lower under her arm and goes below her hip. It’s made of hard plastic that has to fit really tightly. At her appointment tomorrow, they will take an x-ray of her in the brace and expect to see complete improvement. I’m not sure if they’ll take one without the brace. I would think they would because how else would they know if it’s helping? I’m guessing they’ll keep doing x-rays every month or so to monitor it as she grows.